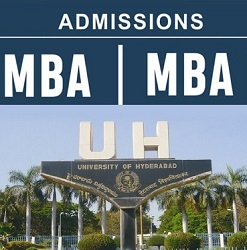 The University of Hyderabad(UoH) has released a notification for the admission into MBA program for the year 2019. The total number of admission seats is 60 and the course time period is 2 years (4 semesters). The specializations offered in the MBA admission are Marketing, Finance, Operations, Human Resources(HR), Entrepreneurship, Business Analytics, and Banking. Candidates have to complete their Bachelor's degree in any branch with minimum 60% marks before June 2019. Candidates should appear in CAT-2018 Exam conducted by IIMs on 25th November 2018. Candidates are called for Group Discussion and Interviews based on the Merit obtained in CAT-2018 Exam. Group Discussions and Interviews will be held in February / March 2018 for the shortlisted candidates.